Yes, we looked twice at those words too, in case there was some mistake. Admittedly, they're applied to We Banjo 3, so what they're really referring to is a loud member of the mandolin family. But the context is the Open House Winter Weekender of Irish and American Folk Music (Thurs. 31 Jan.-Sun. 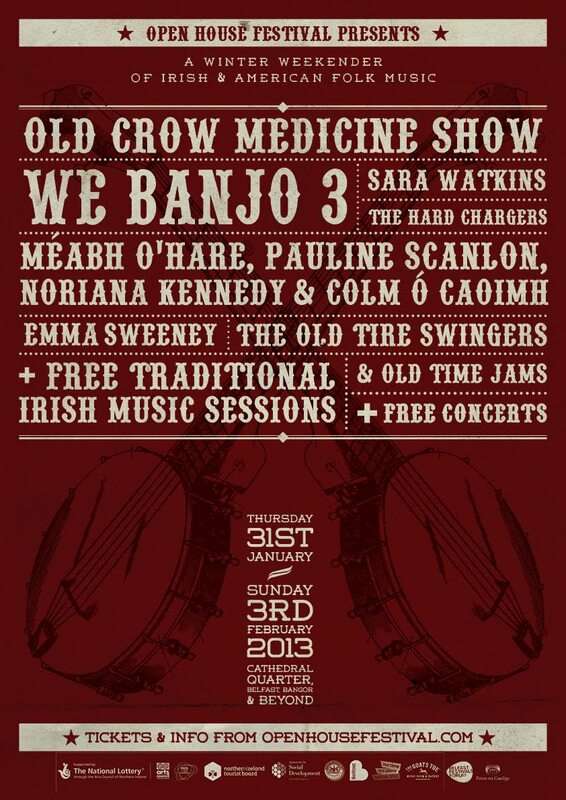 3 Feb.) in Belfast and Bangor - 'a celebration of all that is good and true about American and Irish folk music', for which the lineup includes Old Crow Medicine Show, Sara Watkins, the Old Tire Swingers, and our own Noriana Kennedy. Read the full Open House press release here, and get further information and tickets on the Open House website. Update 17 Jan.: You can now read extra Open House press releases on Sara Watkins and We Banjo 3.